It’s amazing how a smell, taste or texture can evoke a memory. A moment in time can be recaptured with a familiar spice or melting mouthful. And what’s become obvious to me (after reading this book) is that food’s place in our identity is a universal thing, shared by all cultures regardless of the cuisine. This book is different from your normal ‘fusion’ cook-book. Between the complex and sometimes adventurous dishes, are stories of immigrants and refugees told through food. It’s unpretentious or political – it’s just families recording their precious recipes. In sharing their memories and meals, the contributors inspire laughs and awe and some bloody yummy dishes. In Short: For food lovers and world citizens. Try the Beriani and Koulouraki! 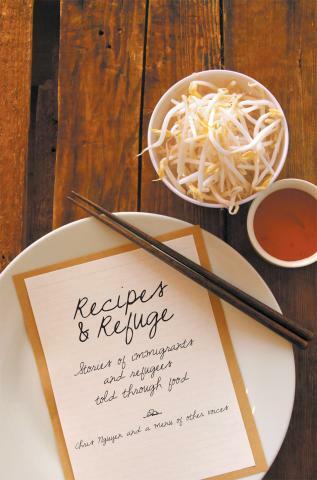 This entry was posted in Cooking, Memoir, Non Fiction and tagged Chris Nguyen, Cooking, Rag & Boneman, Refugees, World Cuisine on December 4, 2013 by jadetam.